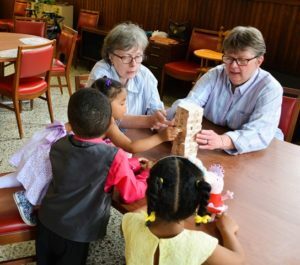 Since 1994, Sister Sandy Kiefer and Sister Lynn Miller have opened their home and hearts to foster children from newborns to age 17. Shortly after receiving state certification, the Sisters got their first call as foster parents: a four-year-old girl who was blind, deaf and paralyzed and who was in need of a home. They welcomed little Mary, and, within weeks, their foster family grew to four children. Since then, they have a provided a safe, loving and nurturing environment for 91 children. Children have arrived at their home all hours of the day and night, most with nothing but the clothes on their backs. Some arrive alone or with siblings. Some are medically fragile. All experience the trauma of being separated from all that is familiar. Children have stayed as little as 12 hours or as long as two and a half years. Some are reunified with family; others leave for an adopted home. For both Sisters Lynn and Sandy, foster parenting, or more recently referred to as “resource parenting” is a definite call to love and care for the dear neighbor. With your donation to the United Way, you can help Sisters Lynn and Sandy continue to provide a caring home for children, many of whom have physical, emotional and psychological needs. Please choose United Way agency code 7260 to support the Sisters of St. Joseph Foster Care Program. United Way campaigns run from September 1 to April 30. If you live outside of Western Pennsylvania, please contact your local United Way agency for instructions on how to designate a gift to us. For more information, contact Christina Thornburg, Resource Development Manager, at 724-869-6574 or cthornburg@stjoseph-baden.org.